Press ads and web banners aimed at people who take their walking seriously. Responsible for: concepts, copywriting and art direction. 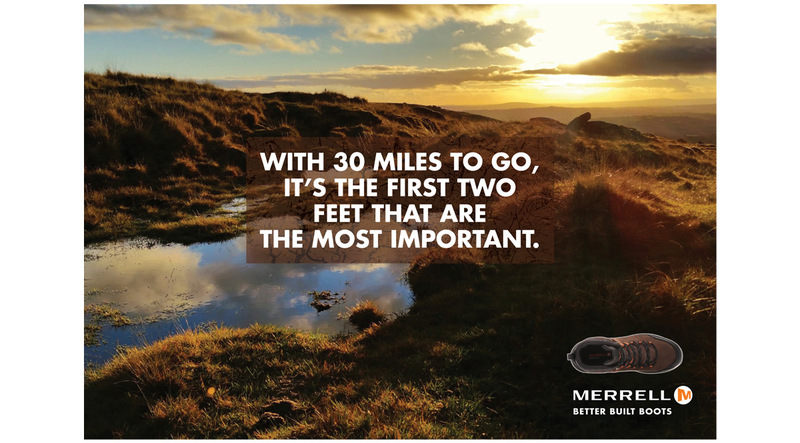 Merrell – advertising concepts and copywriting. If you’ve ever tried to trudge to the top of Mount Snowdon or Scafell Pike in a pair of mediocre walking boots, you’ll know why you should have invested in a pair of Merrells. This campaign concentrates on the drama of the landscapes that can only be enjoyed when you’re wearing a proper pair of boots. The strapline ‘BETTER BUILT BOOTS’ gets straight to the point and helps to justify Merrell’s premium pricing. Press avertising and web banners.